Normally in this space on Friday, I try to break down the Panthers' next game and offer a prediction as to how it will turn out. I'll do the prediction only this time -- I think Atlanta will win 38-6 -- but otherwise will leave the rest of the notes on the Panthers-Atlanta game for the "Scott Says" version that will be published in the print edition of our Sunday sports section. Instead, I want to talk about John Fox for a moment here. Fox has had his ups and downs as a Panther coach over a nine-year period, and certainly there are things he could do better. But in general, I want to commend Fox, who was officially told by Jerry Richardson what we have all known for a long time Friday -- that his contract (and the contracts of his assistants) will not be renewed for 2011. Fox is a good man and a good coach, and this about-to-be-2-14-season is simply a bad ending for him. He will rebound from this. Coach Fox -- Thanks for the memories, especially that amazing Super Bowl run. Some of my all-time favorite sports moments came during your years as a Panther. Thanks for never quitting and never letting your players quit, either. Hope you have a great run with your next team, and for our sake that it's in the AFC. If anyone else would like to chime in like Joshua and thank Coach Fox for some moment over the past 9 years -- now that the Panthers have finally made it official and said that Fox won't return in 2011 -- feel free to comment below. This is what everyone you ask seems to say about the Stanford quarterback, and that was my first impression as well after I asked Luck some questions for the first time Friday. The redshirt sophomore will likely be the No.1 pick in the 2011 NFL draft if he chooses to come out early. That’s what Carolina Panther fans are hoping for, of course, but Luck made no indication which way he was leaning on that huge decision that must be made by Jan.15th. “It’s not a forbidden topic or anything, but I really am trying to avoid thinking about it until after this game,” Luck said, speaking of No.5 Stanford’s Monday night Orange Bowl showdown against No.13 Virginia Tech. Luck didn’t shy away from “Will you stay or go?” questions at his news conference in Fort Lauderdale Friday and later in a smaller gathering with several reporters that included me. But he didn’t say much about the decision either. “It’s a big life decision, and I better put some thought into it,” Luck said. Luck does sound like he truly enjoys the college experience – he carries a 3.5 grade-point average in his architectural design major. He is also a big fan of the other Stanford athletic teams, staying up to watch Stanford’s women’s basketball team upset Connecticut and ended its 90-game win streak Thursday night. He said of Stanford coach Jim Harbaugh’s similar stay-or-go decision on his own choice: “Obviously, it will be a factor.” But Luck wouldn’t rule out staying at Stanford even if Harbaugh leaves for a college or NFL job. Mostly, though, Luck sounded focused on Virginia Tech. He seemed totally unaware that New Year’s Eve is tonight, for instance – or that the fervent wish of many Panther fans as the New Year approaches is that they will get Luck-y in 2011. My extensive story on Luck, his background and his upcoming decision will appear in Sunday’s Observer and online. A Stanford source told me today: "If Andrew Luck had to make his decision today as to whether he would stay or go to the NFL, he'd say he was staying in school." The source -- who is heavily involved with the Stanford football program and sees Luck every day -- said that statement doesn't mean that Luck has ruled out declaring himself eligible for the 2011 NFL draft. But the source said he "knew" Luck was leaning toward staying at this moment, as the redshirt sophomore quarterback prepares for Monday's Orange Bowl showdown with Virginia Tech. "A lot can happen between now and Jan.15th," said the source, referring to the date underclassmen must declare themselves eligible. "There will be a lot of conversations still to come. And whenever he goes pro, he will be a fantastic NFL quarterback. But this is a kid who truly enjoys college." The source continued: "For a lot of guys who declare early, it's partly because the schoolwork is such a grind for them. It's not that way for Andrew." Luck, a co-valedictorian of his high school class in Houston, Texas, has a grade-point average of over 3.0 at Stanford while majoring in architectural design. Of course, you could argue that anyone involved with Stanford has such a vested interest in Luck staying that they may see what they want to see, not what is ultimately there. Luck has made no indication of his future plans here in Miami/Ft. Lauderdale and is not available to the media today. Luck will have a press conference Friday that I will cover and post something about by Friday no later than 11:30 a.m. I'm in south Florida covering the Orange Bowl and Luck this week for The Charlotte Observer and will update this blog every day with news about Luck, Virginia Tech and whatever else is interesting through next Tuesday. My first story for the newspaper about this Orange Bowl will appear Friday. My extensive story on Luck (who would likely be the Carolina Panthers' choice with the No.1 draft pick if he comes out early) will appear in Sunday's Charlotte Observer and online. I'm in the Fort Lauderdale/Miami area, where I'll be through Tuesday, reporting on one of the most fascinating college bowls of the season for The Charlotte Observer. The Orange Bowl will feature Stanford vs. ACC champ Virginia Tech, which is a fine game in any case, but has the added bonus of featuring Stanford QB Andrew Luck. Luck, for the uninitiated, is likely the No.1 draft pick of 2011 -- if he decides to come out early. The Panthers hold that No.1 pick. As a redshirt sophomore, Luck will need to make that decision by Jan.15th. He's coached by another hot commodity in Jim Harbaugh, who has been rumored to be headed to Michigan or to one of several soon-to-be-open NFL coaching jobs, including the Panthers' post. First of all, though, this game has to happen. Virginia Tech has won 11 straight games, whipped Florida State in the ACC title game in Charlotte and will be a formidable foe. Stanford and Virginia Tech are both in south Florida now and practiced Wednesday. Luck and Harbaugh both talked briefly after practice and did a nice job of not saying much. Luck didn't address his upcoming decision after practice but did speak about several topics. Merry Christmas and Happy Holidays to all Charlotte Observer and "Scott Says" readers. I hope you have a wonderful one and I appreciate very much you checking this space occasionally. 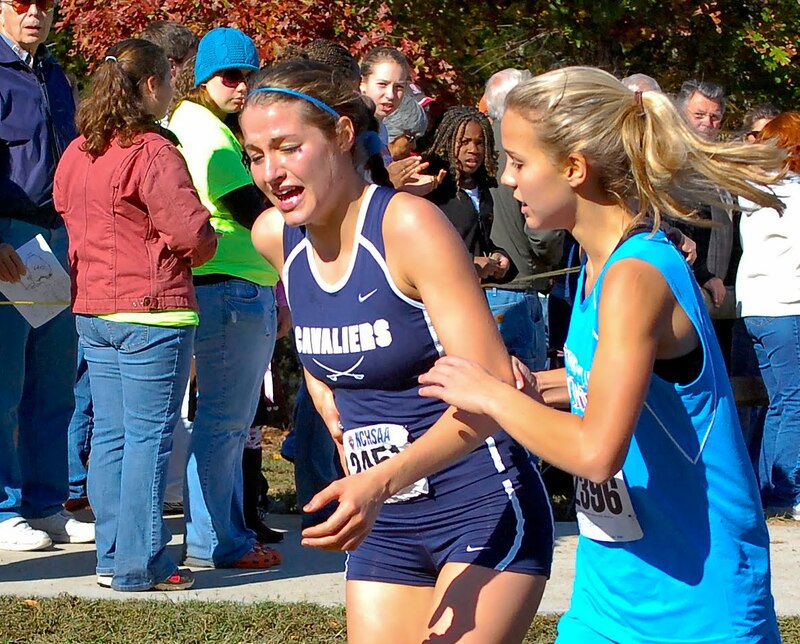 I have been working for a couple of weeks on a Christmas Day story that was published today and can also be found here -- on a couple of girls' high-school cross country runners who now share a bond thanks to something terrible and wonderful happening at a meet two months ago. Phil Hoffman of the Observer staff also put together an excellent video documenting the story, called "A Magic Touch." Hope you enjoy! It was a great pleasure working on this story featuring Deb Guthmannn and Jenna Huff, and I appreciate their help in illuminating the sort of good sportsmanship you just don't see often enough in sports. Now let's just hope for a White Christmas together, shall we? 1. First-drive punt. OK, so Carolina actually had a bit of momentum. The Panthers are moving the ball, it's 0-0, and they get to Pittsburgh's 32 on the first drive of the game. It's fourth-and-5. I understand it's too far for a field goal, that you just don't hit 50-yard field goals at Heinz Field that often (3-for-15 on the most recent 15 tries, as a good graphic pointed out on NFL Network). But how do you not go for it there, John Fox? How do you not try for points, knowing how bad your offense is? Instead, Fox stuck to the conservative tendencies that run so deep in his bloodstream, punting. Carolina couldn't down the ball correctly, so Pittsburgh got it at its own 20 (only a 12-yard gain in field position) -- and broke off a 36-yard run on its first play. Fox seemed to admit this mistake when he faced the very same situation on the next drive -- and then went for it, down only 3-0. That didn't work, either -- but at least at that point, he was trying. By then, though, the Steelers were rolling, and it was already too late. 2. Joe Theismann. Ohmigosh, I had forgotten what it sounded like to hear Theismann for a full game. Does anyone in any TV booth talk more and say less? I liked Matt Millen -- including his line about Jonathan Stewart ("That's a 100 percent USDA man".) I can't remember a thing Theismann said, except he always seemed to be talking and he usually seemed to be apologizing for Jimmy Clausen. 3. Jimmy Clausen. Speaking of Clausen, how inept was he? He had little help, as usual, but his split-second decisions were awful. He kept holding onto the ball and getting sacked, or checking down and not taking shots downfield, or taking an occasional shot but overthrowing it. As I've written before, he simply is not the long-term answer here, and the sooner everyone realizes this, the better. 4. Panthers' pass defense. Ben Roethlisberger had 259 yards passing -- in the first half! He shredded Carolina's defense, most beautifully on that pass to the slot receiver when he caught Carolina in an ill-timed safety blitz for a TD. The Panthers' only good pass defense came when Charles Johnson -- definitely the defensive MVP of this team -- sacked or harassed Big Ben. Otherwise, the ball was going to be complete. 5. Steve Smith. The Panthers actually did try to get him the ball in this game. Smith dropped one 20-yard pass (which would have been called back by an unrelated penalty anyway), caught a couple of short ones and had yet another game without a TD or anything close to it. It's become routine by now. Pittsburgh and Carolina play so rarely in the regular season that the only game I really remember between the two games came in that starry year of 1996, when everything seemed new and possible for Carolina. Remember that one? Kordell Stewart went 80 yards for a touchdown. Sir Purr dove into the end zone when a punt was still live and jumped on the ball. ESPN later replayed that leap and flashed a graphic that read: Sir Purr. Punt Returns: One. Yards: Zero. Ultimately, a playoff-bound Carolina team would edge Pittsburgh, 18-14, at home when safety Chad Cota intercepted Stewart. I must have heard Bill Rosinski's call of that play 100 times: "Stewart back to throw, fires in the end zone. What is it? What is it? INTERCEPTED! The Panthers have it! The Panthers have it!" Tonight won't be nearly as exciting, I'm afraid. The talent level will be too great for the Panthers to make up. I'm 11-3 picking Panther games this season -- I chose Carolina to beat Arizona last week. But this one won't turn out so nicely. Larry "Next Town" Brown has never been one to stay in one place. So whether this sudden resignation from the Charlotte Bobcats was totally his idea -- and it's very hard to believe that it was -- you had to figure this day was coming. Brown, 70, has now coached nearly a third of the NBA's 30 teams. His resume is longer than "Of Mice and Men." He's a hall of fame basketball coach and a delight to talk with for writers like me. But he's also inherently restless -- a perfectionist who eventually wears out his employers and his players, or else vice versa. And Brown's deep insecurities always make him a threat to bolt. As Richard Vinroot, Charlotte's former mayor and Brown's former roommate at UNC-Chapel Hill, told me about Brown long before he ever was hired in Charlotte (but shortly after things wore out in Detroit, even though Brown had gotten to two straight NBA Finals there and won one of them): "For him, life is either perfect, or he's outta there." Life certainly wasn't perfect lately for the 9-19 Bobcats, who have not only been losing games but have been losing them by 20 or 30 points. Team owner Michael Jordan obviously was more than miffed at this development -- as majority owner, he now has a lot more skin in this game than he used to. To be fair, this wasn't all Brown's fault (and I'd wager him resigning it wasn't completely his decision). This team is worse, talent-wise, than last season's. Brown has less to work with, but he was also getting less out of what he has. It's not just Larry's fault, but you can't trade all the players (much as Brown and Jordan probably would like to on some days). So instead, the coach is gone -- which of course is Jordan's prerogative, but should be explained in more concrete terms by the Bobcats to their fans. What comes next? In the short term, it's Paul Silas. The Bobcats could hardly do better for an interim coach that they announced only about three hours after announcing Brown was stepping down. Silas is a fine communicator, well-respected everywhere and happens to live in the Charlotte area. Still, this has been an earthquake of a day in Bobcat-land -- a day that you know must come when you hire Larry Brown, but still one that will leave tremors and aftershocks for months. 1) Jonathan Stewart and the offensive line. "Stewie" went for 137 yards, pounding the ball again and again and starting the game with a flourish with a 35-yard run that set the tone. 2) It was a "guilt-free" win. Thanks to Cincinnati's 19-17 win over Cleveland, the Panthers (2-12) are still a game worse than every other competitor in the race for the No.1 draft pick. So enjoy this one, Panther fans -- there are really no negative repercussions to it. 3) Jordan Senn. The special-teams standout recovered not one but two attempted onside kicks Sunday -- this after giving an impassioned speech to the team Saturday night. 4) Jimmy Clausen. I've been critical of Clausen numerous times, and I still don't think he's the long-term answer for Carolina, but let's give credit where it is due. Clausen played error-free football Sunday, threw a TD pass to Jeff King (his first since Week 4) and had a QB rating of 107.6. 5) John Fox. What a nice note to go out on at home for the Panthers' head coach of the past nine years. Although he won't coach in this stadium again -- not for the Panthers, that is -- he won his final game here playing his kind of football and also guaranteed a record above .500 for his Panthers' career. Carolina won its second game of the season Sunday in what should be John Fox's final home game as the Panthers' head coach, defeating Arizona 19-12 in the most complete game the Panthers have played all season. Fox went out with a flourish as the Panthers won the game the way they long did under the coach -- with a strong running game, defense and special teams. That combo was spiced with a few good passing plays and a turnover-free effort from rookie quarterback Jimmy Clausen, and that was enough to win even though Arizona (4-10) scored nine fourth-quarter points to make it interesting. Carolina broke a seven-game losing streak with the victory. The Panthers (2-12) remain in the No.1 spot for the 2011 draft since Cincinnati (3-11) edged Cleveland, 19-17. So this was a true guilt-free win for Carolina. Panther running back Jonathan Stewart keyed the offense with 137 yards rushing. Clausen had an error-free day, going 13-for-19 for 141 yards and one touchdown -- a 16-yarder to Jeff King. The Panthers got four field goals from John Kasay for the rest of their points. Arizona scored on a fourth-quarter TD (missing the two-point conversion) and two field goals by Jay Feely. Feely also missed on two onside-kick attempts during the game -- the second, with 0:54 left, was recovered by Carolina's Jordan Senn for the second straight time, cinched the Panthers' win. Senn then gave Fox a hug and also the ball he recovered as Fox smiled broadly. Arizona got its first TD of the game with 5:41 left in the fourth quarter, but then failed on a two-point conversion. That leaves Carolina ahead, 19-9 -- a two-score margin that should be secure as long as the Panthers don't turn the ball over again. Carolina was rolling inside the Arizona 30, ahead 19-3, when Jonathan Stewart lost a fumble. That led to Arizona's first TD scoring drive, set up by a long pass from John Skelton to Steve Breaston. Breaston then scored the TD in a strange way -- Skelton completed a short pass, which was fumbled into the end zone, which Breaston pounced on. The Cardinals then tried to fool Carolina on the two-point conversion attempt, putting three receivers wide and then running up the middle. Tyler Brayton stuffed Tim Hightower about a yard short, keeping Carolina ahead by 10. John Kasay's fourth field goal -- a 43-yarder -- just gave the Panthers a 19-3 lead with the third quarter at an end. Unless Arizona can score a couple of touchdowns and two-point conversions in the fourth quarter, Carolina (1-12) is on its way to its second win of the season. Kasay is 4-for-4 today on field goals. That drive would never have happened except the Cardinals -- after forcing a Carolina punt -- roughed punter Jason Baker and gave Carolina a new set of downs starting at the Arizona 35. For those curious about how this would affect the Panthers' draft status -- for now, they have the No.1 pick in the 2011 draft -- so far it won't. Cincinnati (2-11) is beating Cleveland by nine points at the moment, so this could be a guilt-free win. Knowing the 2010 Panthers, though, there may be one more surprise in store before this day is over. Carolina has extended its lead to 16-3 with a field goal early in the third quarter, helped by an Arizona onside kick to open the second half that went awry. Arizona coach Ken Whisenhunt called for his kicker, Jay Feely, to try an onside kick down 13-3 at halftime. But Feely hit it poorly, knocking it only 7 yards instead of the required 10. Carolina's Jordan Senn recovered at the Arizona 37. The Panthers moved to a third-and-4 from the Arizona 6, where Jimmy Clausen tried to throw a fade pass to Steve Smith but had it batted away. Kasay then came on to kick his third short field goal of the game. Arizona is finally on the board at Bank of America Stadium with a field goal, but Carolina still leads, 13-3, at halftime. Arizona went 46 yards in 12 plays to get to the Panther 5 before Tyler Brayton knocked away a third-down pass from rookie John Skelton, who has so far been outplayed today by Carolina's Jimmy Clausen. Jay Feely's 25-yard field goal cut the Panthers lead to 10. Carolina then ran out the clock to go into halftime with a 10-point lead. Clausen is 6-for-10 for 87 yards and a touchdown. Jonathan Stewart has rushed for about 80 yards at halftime. The Panthers have taken a 13-0 lead midway through the second quarter on a 16-yard TD pass from Jimmy Clausen to tight end Jeff King. The play was set up by Sherrod Martin's interception return to the Arizona 16 of a terrible pass by Arizona rookie QB John Skelton. Carolina then took only one play to score, as a fake to Jonathan Stewart (who has already rushed for more than 70 yards) totally fooled the Arizona defense. King ran into the end zone, spiked the ball between his legs and then looked like he was surfing. It was Clausen's second TD pass of his career and his first since Oct.3rd. The Panthers have extended their lead to 6-0 with 14 seconds left in the first quarter -- John Kasay hit his second field goal of the game, this one a 29-yarder. It was another impressive drive for Carolina -- 14 plays and 80 yards, starting from its own 9-yard line. The biggest play was a 29-yard strike from Jimmy Clausen down the sideline to David Gettis, who fought off defensive holding to make an acrobatic catch. Jonathan Stewart also had several good runs. On third-and-12 from the Arizona 14, the Panthers ran a draw to Stewart that didn't work. This brought a gush of boos from the stands, which are about half full at this point. Still, Carolina leads 6-0 as the first quarter comes to a conclusion. Arizona has yet to offer any sort of scoring threat. The Panthers started Sunday's final home game of the season nicely, taking a 3-0 lead on a 28-yard field goal by John Kasay less than five minutes into the game. Carolina's defense started with a 3-and-out on Arizona. Following came a punt, and Captain Munnerlyn ran it back 71 yards inside the Arizona 20 -- only to have that return nullified by an illegal block on Greg Hardy. It didn't take Carolina long to get back there, however -- Jonathan Stewart broke a 35-yard run on the Panthers' first offensive play and then Jimmy Clausen hit a short pass that Brandon LaFell turned into a 20-yard gain. The drive sputtered, however, when Clausen put a third-down pass that could have been a touchdown way too low for Mike Goodson. Kasay's field goal made it 3-0, Carolina, with 10:22 left in the first quarter. This is why I never bet on sports events. How in the world, I would have asked you before Friday night, could the Charlotte 49ers ever hope to beat Tennessee? The 49ers’ roster was severely depleted due to injuries and new coach Alan Major’s dismissal of Shamari Spears, the team’s best and most problem-plagued big man. I watched the 49ers get absolutely hammered in the second half at Davidson last week, losing by 14 to the Wildcats. Tennessee, meanwhile, was ranked No.7 and coming off an upset loss to Oakland. Surely the Volunteers would be primed and ready for this one. No, they weren’t, and stop calling me Shirley. The 49ers, fittingly, scored 49 points. That was just enough to beat the Vols by one, 49-48, Friday in a game I didn’t attend but wish I had. Charlotte (5-6) totally outplayed a wilting Tennessee squad down the stretch, paced by playmaking guards Jamar Briscoe and Derrio Green. And Major totally outcoached Tennessee loudmouth Bruce Pearl, keeping the game at exactly the languid pace the 49ers needed to thrive. The win came at the Charlotte Bobcats’ home arena, where there hasn’t been much excitement this season given the Bobcats’ 9-17 start. But on this nutty night, some Charlotte fans – 49ers, not Bobcats – got to storm the court. This was the first signature victory of Major’s very first season at Charlotte, one that the coach no doubt will remember 30 years from now. It’s the sort of win that can start to make believers of a lot of people – including me. -- Who was the most recent quarterback to throw five interceptions in this series? If you said Jake Delhomme, you’d be wrong. Yes, Jake did exactly that in the infamous playoff game Jan.10, 2009. But it was Kurt Warner who unraveled in November 2009 in the Panthers’ 34-21 win in Arizona, throwing five picks. -- These two teams’ troubles at quarterback have been close to mirror-image this season, too. You know the Panthers’ issues. The Cardinals, meanwhile, starting in August have gone from Matt Leinart to Derek Anderson to rookie Max Hall, back to Anderson and now to rookie John Skelton. -- With two rookies scheduled to start at quarterback Sunday – Skelton for Arizona and Jimmy Clausen for Carolina – let’s just say that the blitz will be a well-used weapon. Skelton won his first start last week with the Cardinals, even though he completed only 15 of 37 passes. -- In the awful NFC West, the Cardinals are only 4-9, sit in the division cellar and still aren’t eliminated from the “race” to win the division. They are just two games behind co-leaders St. Louis and Seattle, who are both 6-7. Somebody from the West is going to end up with a first-round home playoff game, which is just plain wrong. -- The Panthers rushed the ball very well at Arizona last season and will try to do exactly the same thing Sunday. It has been enlightening to see Mike Goodson become such a big part of the offense in DeAngelo Williams’ absence. -- I’m 10-3 picking Panthers’ games this season. I’ve picked them to lose so many times in a row I’ve lost count, but I’m thinking they will do just enough Sunday behind their revived running game to possibly mess up getting the No.1 draft pick in 2011. Wouldn't that be sort of typical? My pick: Carolina 17, Arizona 16. I wrote my column for Thursday's newspaper and online here on how these are the sorts of times that try a pro sports fan's soul in Charlotte. That's not to say there's nothing to cheer for in Charlotte and the surrounding areas. Your local high school or middle school team may be having a great year in something. You might be a Duke fan, in which case you have to be ecstatic. You might enjoy going to Checkers games. You might be the parent of a youth league football team that just won a national championship in its division. But, more than likely, you are also a Panther fan at some level if you live in our area. The NFL is easily the No.1 spectator sport in America, and Panther games still easily get far more viewers than the next 2-3 sports combined. So there is something of a pall cast upon a city when a team goes 1-12 like Carolina has this year -- at least I feel one. Of course, I'm in that business. I know there are many more important things in life, but people like to talk about the weather and about football this time of year, and both of them have been pretty darn bad lately. My column today on Jimmy Clausen and how unfit he is to be the Panthers' long-term quarterback has drawn, at last count, 225 comments, which isn't the most a story of mine has ever gotten but has to be in my personal top 10 all-time. Q: Are you saying Clausen shouldn't be a Panther at all in 2011? A: No, I'm not saying that. I'm saying he should be a backup. I think he could do that job adequately, but I think we've seen enough now to know he will never be an elite NFL starter and possibly never an adequate one, either. Certainly, he is pretty terrible right now. Q: Should the Panthers start Brian St. Pierre now? Or Armanti Edwards? A: No and no. I agree with John Fox, who says he doesn't anticipate a change at this point. BSP certainly isn't the long-term guy here -- might as well give Clausen the work, because he needs all the reps he can get. And Edwards? I'd like to see him with 4-8 plays in the shotgun "Mountaineer" formation next week, absolutely, but he is ill-equipped to be an NFL starter at this point because he has been playing WR most of the year. Q: What about Cam Newton? Shouldn't the Panthers draft him if Andrew Luck decides to return to Stanford for his junior year (but Newton, a junior, declares early as expected)? A: I don't see why not. As I wrote today, I think the Panthers have to take a QB with their first pick, because that's the NFL's most important position (and it's not close), and they don't have their QB of the future on the roster right now. Time for the traditional "5 things I didn't like" blog. Don't know if yall even remember, but I do actually write a "5 things I did like" blog whenever the Panthers win -- that just hasn't come up for awhile. 1. Jimmy Clausen. The Panthers' overmatched rookie quarterback has now thrown 193 passes in a row without throwing a TD pass. He threw 24 passes Sunday and only got 107 yards out of them. He is 0-7 as a starter and still hasn't had a 200-yard passing game. Clausen will be the subject of my column for Monday's newspaper, and let's just say it's not going to be pretty. (UPDATE: here's the column). 2. The weather in Charlotte. In a word, nasty. Panther coach John Fox said that -- given the cold drizzle and the fact his team was 1-11 entering Sunday -- he couldn't blame the fans for not showing up. And they didn't. (The sun did come out for awhile in the second half, though). The percentage of empty seats -- easily more than half were empty -- reminded me of a Monday night Bobcats-Timberwolves game at Time Warner Cable Arena. 3. The first quarter. Carolina was outgained 133-6, outscored 14-0 and out-first downed (I know, it's not a word) 7-0 in the first 15 minutes. Not much of a way to reward those loyal fans who did show up. 4. The pass blocking. Clausen was sacked five times as Atlanta blitzed often to take advantage of the rookie's inability to make good decisions consistently. 5. The "no lateral." OK, it's a little thing. Richard Marshall made a nice play on the last play of the first half, intercepting Atlanta QB Matt Ryan with a lot of room in front of him (but also 5-6 potential tacklers). Marshall had to score to make the play really count, though. He was hemmed in at the 40, which would have been just the right time to try one of those risky laterals so many defensive players love to try in practice. Instead, Marshall just went down, taking one of Carolina's few scoring chances with him. Carolina dropped to 1-12 Sunday with a 31-10 loss to Atlanta Sunday at Bank of America Stadium in what was easily the most poorly-attended home game of the year in Charlotte. I'd estimate the actual turnstile count Sunday was around 25,000, which left almost 50,000 empty seats on a day where the weather forecast was bad, it drizzled early and was cold the whole time. Atlanta jumped to a quick 14-0 lead in the first 10 minutes of the game and the Falcons (11-2) were never seriously threatened after that. By the end of the game, there might have been 1,000 people left. Michael Turner scored three touchdowns for Atlanta. Matt Ryan threw for 227 yards for the Falcons and controlled the game most of the time he was on the field. On the positive side: The Panthers are still in line for the No.1 draft pick in the 2011 draft. The Panthers were able to rush the ball very successfully Sunday -- for more than 200 yards all told -- but as usual couldn't throw it to save their lives. Jimmy Clausen barely managed to throw for over 100 yards, getting just enough on the last play of the game. The Falcons just took their biggest lead of this game, going ahead 31-10 on Michael Turner's third TD following a Jimmy Clausen interception. Clausen threw a rare ball down the middle on the Panthers' previous possession, and it was tipped, picked off and returned to the Carolina 16. It took Atlanta four plays to score from there, with Turner scoring standing up and drawing many boos from the few fans left in the stadium. The Panthers have gotten a 36-yard field goal from John Kasay, cutting Atlanta's lead to 24-10 with 9:44 left in the fourth quarter. The Panthers got just inside the Atlanta 20 -- again with the run, as Jonathan Stewart and Mike Goodson have now combined for more than 200 rushing yards -- before stalling when Jimmy Clausen tried to hit Gary Barnidge ("Gary Barnidge?!" TV analyst John Lynch said disbelievingly) on third-and-6. The Panthers did have a couple of bright moments on the previous defensive possession, too, sacking Matt Ryan on two straight plays. There are maybe 10,000 fans left in the stadium, but there probably weren't more than 25,000 to begin with. The Falcons just squashed any real hopes of a Carolina comeback, scoring on a 3-yard run by Michael Turner to extend its lead to 24-7 with 4:41 left in the third quarter. The Panthers, down 17-7, had gotten the ball to the Atlanta 38 after Jonathan Stewart (11 carries, 114 yards so far) ripped off a 42-yard run. But then Steve Smith dropped a low throw from Jimmy Clausen that could have gotten a first down. Coach John Fox elected to go for it on fourth-and-4 from the Falcons 38 -- it would have been a 56-yard field goal for John Kasay -- and Clausen took a sack for a loss of 13. That gave Atlanta great field position, and the Falcons only needed 5 plays to traverse 49 yards for the TD -- three of them passes to Pro Bowl wide receiver Roddy White. Just after the Panthers' offense had had one of the worst halves in franchise history, it started the second half with a big bang. The Panthers went 81 yards in five plays on their opening drive of the second half, scoring on Mike Goodson's 13-yard TD run and slicing Atlanta's lead to 17-7. The entire drive was on the ground and was punctuated by Jonathan Stewart's 48-yard run to the Tampa Bay 21 (there was great blocking on the play). Before that was a 12-yard Steve Smith reverse -- Smith's first touch of the day -- and after that there were two Goodson carries, for eight yards and then the TD. With just over 10 minutes left in the third quarter, Carolina is within 10. Atlanta just ground out one of those long marches it has made a living on this season, taking 18 plays and 8:38 off the clock before scoring on a 39-yard field goal from Matt Bryant to make it 17-0 with 2:34 left in the second quarter. The Panthers did stop the Falcons, finally, thanks to Jon Beason's deflection of a pass and sure tackle on successive plays. But Atlanta cashed in anyway on Bryant's field goal, making it a three-possession game for the Panthers. Carolina got the ball back, couldn't move it (of course) and punted. Matt Ryan made a rare bad throw on the last play of the first half, which was intercepted by Richard Marshall, and the Falcons went into the half ahead 17-0. A couple of halftime stats for you: the Panthers have two first downs so far (Atlanta has 13). Quarterback Jimmy Clausen is 3-for-5 for 14 yards and has been sacked four times for minus-19, so the Panthers actually have lost five yards passing so far. Atlanta has outgained Carolina, 202-33, at halftime. The Falcons have now scored on each of their first two possessions, and they lead 14-0 after a one-yard Michael Turner plunge with 6:51 still left in the first quarter. Jimmy Clausen has yet to throw a pass for Carolina -- which fumbled on its first offensive play and went 3-and-out on its second series -- and the Falcons already have what should be an insurmountable lead against the NFL's worst offense. The Falcons' key play was a third-down conversion from Matt Ryan to Harry Douglas that went for 46 yards as Douglas beat rookie Robert McClain down the sideline (but not my much; Ryan's throw was perfect). After that, it took Atlanta three runs from the 9-yard line to score. Turner fumbled on one and Jordan Senn recovered, but Turner was ruled down on the field before the fumble and, after a John Fox challenge, the call was upheld. The Carolina Panthers couldn't have started much worse on a dreary day at Bank of America Stadium. Carolina got the ball first and -- on its first play from scrimmage -- Jonathan Stewart fumbled the ball away. Atlanta took only 3 plays to score from the Panther 29 after that -- a 9-yard pass, a 16-yard run from Michael Turner and a 4-yard pass from Matt Ryan to Tony Gonzalez for the score. After 85 seconds, the Panthers were down, 7-0. At least not too many people saw it in person -- the stands look to be about 1/3 full. -- The 10-2 Falcons have to be salivating at the idea of facing 1-11 Carolina twice in the season’s final four weeks. They will play again in the Georgia Dome Jan.2, which will be the last game that coach John Fox and most or all of his staff will be employed by the Panthers. -- The two teams really couldn’t be more opposite. Atlanta is tied with New England for the best record in the NFL. Carolina has the worst. The Falcons have won six straight. Carolina has lost six straight. -- Atlanta isn’t blowing people out like, say, New England. The Falcons have won seven games in the fourth quarter or overtime this season. And they are only one game up on New Orleans (9-3) in the NFC South race, however, meaning the Falcons’ playoff position could be almost anywhere. Atlanta would be No.1 if the season ended today, but could drop all the way to No.5 if the Saints overtake them. So this game means a lot to Atlanta – and Jan. 2nd likely will, too. -- The most damning statistic about quarterback Jimmy Clausen right now is that he’s thrown more touchdown passes to the other team (two) than to his team (one). Clausen is not throwing enormous numbers of interceptions – and he’s got to lead the league in throwing the ball away – but the ones he does throw seem extremely costly. -- I’m 9-3 picking Panther outcomes this season. This one would seem to be almost too easy, but Carolina actually plays the Falcons tough most of the time and I wouldn’t be surprised to see the game stay tight for a half. Bottom line, though: Falcons 24, Carolina 10. Q: Would you rather spend big money on a big name coach for the Panthers or go under the radar with a previously unmentioned coordinator and use that cash to load up on free agents? Or will Jerry just go cheap and keep the money for himself? A: The coach and the quarterback are the two most important components on an NFL team. So I think you get the right guy at the top, whatever that takes. Do that first. Then hit a home run in 2011 draft. And then, suddenly, the players who look so bad this year may not look so bad anymore. Q: Scott, what do you make of Coach Fox's comment of "I have no idea what you are talking about" in regards to JR's letter to the PSL holders yesterday. Is the lack of communication and their relationship really THAT bad at this point? A: I thought it was great evidence of the disconnect between Fox and Richardson -- amazing, really, that a letter would go out to 60,000 PSL holders and Fox would never know that it happened. Q: Scott, I just saw an NBA mock draft for 2011 showing Harrison Barnes the #2 overall pick, is he really considered to go that high? A: Ridiculous. Just like putting Barnes on the first-team preseason All-American team was ridiculous. Does a lot of things pretty well, but does nothing unbelievably well at this point. If anyone took Barnes at No.2 right now, that'd be a mistake. Q: Scott, why does your partner Tom [Sorensen] seem to always disagree with the popular opinion of any sporting issue in Charlotte....the most recent example being his article on the Hornets naming issue this morning. predicted the Panthers would go 9-7 this season in the newspaper. For many months, Panthers owner Jerry Richardson has not communicated to the team’s fans at all, except apparently through the occasional random phone call placed to a fan who wrote a letter of complaint and e-mailed it to the Panthers’ website. That has now changed. Richardson has written a letter that has been sent to all permanent-seat license owners. (UPDATE: And, on Wednesday, coach John Fox said he had no idea what a reporter was talking about when asked about the letter. Fox never saw it before it went out -- another sign of the disconnect between owner and coach). Although this certainly isn’t a substitute for actually answering questions about the team, it’s a good first step for Richardson. I thought the letter was too vague in parts but quite well done in others. Here, I have put the contents of Richardson’s letter in my blog and have offered my comments on it in parentheses. Again, Richardson’s letter is restated in full here, but everything in parentheses and italics is what I’m thinking as I’m reading it. I’m not trying to be snarky here, just truthful. So below you'll find a copy of Richardson's letter to PSL holders. If you’d prefer to read it without my commentary -- and I certainly understand some folks would rather do that -- click on the “Inside the Panthers” blog. "I know how difficult the season has been for you. As the person ultimately responsible for putting a team on the field, I take full responsibility for our shortfalls (Nicely done – no excuses, just taking the blame). It is agonizing that we have not performed at the level we had planned for and expected (agonizing is a strong word, but Richardson hates losing enough I believe that it’s true). "When the season began, we believed there was every opportunity for success. (Really? Every opportunity? Oh, c’mon now). Many of the players were returning from a team that had finished last year very strong (and many more weren’t, including Jake Delhomme, Julius Peppers, Chris Harris, Brad Hoover and so on). The motivation for this approach was both performance-based and a commitment to the future. Obviously we have fallen short (by only a couple of thousand miles), but our faith and commitment are still the same. "Going forward, our plan of attack is to build through the draft while retaining our core players (good to restate this). We have one of the youngest teams in the League, and a number of those younger players have shown genuine promise in this otherwise disappointing season (true). We won't give up on them. We also have a solid nucleus of veterans that we will seek to keep intact. "I want all of you to know that we plan to look at every aspect of our organization (this is the only place where Richardson hints that he’ll have a new coach in 2011). What we do in the future will entirely be geared toward putting the best possible team on the field. I am committed to fielding a winning team, and I'm willing to invest the resources necessary to make it happen (this needed to be said, as many fans believe Richardson is doing this year on the cheap). "Allow me to raise another personal issue. Much has been made of my reluctance to address the play of the team in the media. Throughout the history of the franchise, I have rarely done in-season interviews (this is true, but it’s also true that Richardson used to do offseason interviews with some regularity, and that hasn’t happened for a long time, to the detriment of many, including, of course, those of us like me who are in the media business). "It's just not my style. In my opinion, comments from ownership during the season are a distraction, and I do not want my comments to interfere in any way with the performance on the field (but at 1-11, how could it get worse? And you answer questions from individual fans frequently. But, I digress). "This year is further complicated with the uncertainty regarding Collective Bargaining Agreement. (Richardson plays a huge role for the owners in this CBA and is considered a "hard-line" owner). Let me be clear: A successful CBA is critical in sustaining the competitive balance of the NFL. We're all in this together, and what is good for football is good for the continued success of each and every team. It's important for us to reach an agreement that benefits the fans, players, and teams (and, of course, its owners). I want the players paid fairly, and I want us to play winning and exciting football (My contention is still that there will be a lockout but ultimately won’t be any regular-season games missed in 2011, but I’ve been wrong before). "I understand that in a season like this, words can sound hollow (a nice admission here), but, as PSL Owners, you have my commitment to provide you a team that will make you proud (well-done here as well – and it sure better be true). With three NFC championship game appearances, we have come close. I can assure you we will be aggressive in getting there again (no Super-Bowl-in-10-year prediction this time from Richardson -- smart). "Thank you for your patience and support in a very challenging time." 1) Like many NFL fans, I used to watch Dandy Don Meredith and Howard Cosell go at it on "Monday Night Football" and revel in their rivalry. It was a rite of passage for me when I was finally old enough to stay up late enough to hear Meredith sing, "Turn out the lights, the party's over" when the game's outcome was decided. Meredith was a former NFL star who didn't take the game that seriously -- he was playing a Texas cornpone role in those broadcasts and was bright enough, and funny enough, to pull it off for years. When you see those studio analysts yakking it up every Sunday -- well, they all owe a debt to Dandy Don. "MNF" did a nice tribute to Meredith at halftime last night -- the most touching part being when Frank Gifford, being interviewed live by Mike Tirico, said of Meredith "I loved him like a brother," then got teary-eyed and couldn't go on. RIP Dandy Don, who died Sunday at age 72. 2) My column today on the Panthers is called "To Win or Not to Win" and concerns the Panthers' hunt for the No.1 draft pick in 2011 and how many fans are now hoping they go ahead and finish 1-15 to guarantee it (and, likely, Andrew Luck if he declares early). On his way out the door, wouldn't it be ironic if John Fox messed that up for Carolina? 3) Thanks again for those who turned in fake names for a fake book about the Panthers' 2010 season in a blog post a couple below this one -- I used some of those for comic relief in today's column (right toward the end). I gotta say, you "Scott Says" readers are very creative. 4) I will be doing an online chat this week from noon to 1 p.m. on Thursday, Dec.9th. If you have a question but can't make it during that time, e-mail it to me at sfowler@charlotteobserver.com and I'll try to post it and answer it live, time permitting, during the chat. True story. I was at home for this game, watching it on TV with the DVR going. At halftime, with Carolina up 14-3, I fell asleep. I woke up 45 minutes later, looked bleary-eyed at the TV screen, and figured I must have looked at the score wrong. 1) Jimmy Clausen. Up 14-10, he threw a “pick-six” interception to Seattle’s Lofa Tatupu that changed the game’s tenor completely. It’s exactly the sort of error these 1-11 Panthers can never afford to make but usually do, and everything went downhill from there. Clausen was fine handing off, but when it came time for him to move the team through the air, he couldn’t do it. 2) Jeff Davidson. The Panthers’ deservedly criticized offensive coordinator will get another heaping helping after this one. And what were the Panthers doing throwing on third-and-1 with a 14-10 lead anyway? Jonathan Stewart had been the best player in the game to that point – give him the ball. 3) Seattle's 96-yard drive. Up 14-3, Carolina had pinned Seattle at the 4 after a mishandled kickoff to open the third quarter. And then there went the Seahawks – 96 yards straight down the field, giving themselves hope. 4) The 84-yard punt return. Seattle’s Leon Washington is certainly a dangerous return man, and his burst up the middle set up the Seahawks’ third straight touchdown in the third quarter. But no one on the Panther punt coverage team seemed to even get close to Washington except punter Jason Baker, whose miraculous shoestring tackle inside the 5 only delayed the inevitable. 5) The offensive line. How many times get Clausen get clocked in the second half, or else have to throw the ball away to avoid yet another sack? I lost count, but I did notice that the officials felt so sorry for Clausen they actually tried to help him up a couple of times. Note: For those who entered my "Write a Fake Book Title for the Panthers' 2010 Season" contest over the weekend, read the comments of the blog entry below this one if you want some painful laughs (and also the names of the winners). I had a "Free Friday" sort of contest yesterday, in case you missed it. I told people at the bottom of my Panthers-Seahawks prediction blog that, because that was the 1,000th blog post in the 2-plus year history of "Scott Says," I'd give away 5 signed copies of my "Tales from the Carolina Panthers Sideline" book in a random drawing. You had to e-mail me to have a shot at winning, and you only had until 6 p.m. Friday to do it. Several hundred people did just that. I started off trying to respond to the e-mails individually, thanking everyone for their entry and for reading "Scott Says." After awhile, though, I got overwhelmed and had to write my daily column for Saturday's newspaper (on the ACC title game in town Saturday), so I'll thank you again here and apologize for those who didn't receive a personal reply from me. Bryan Detwiler (Davidson); Evan Hill (Charlotte); David Kempert (Raleigh); Anne Cathey (Huntersville) and John Dimier (Charlotte). "Tales from the Carolina Panthers Sideline," incidentally, can still be found in some bookstores, but not too many since it was originally published in 2004 after the Panthers' Super Bowl year. If you're still really wanting it, check your local library and/or my personal website at http://www.scottfowlersports.com/, where it's available cheaply and where you can also see a selection of my personal favorite Charlotte Observer stories over the past decade or so. This Panther contest made me think of one other thing, though. I'm certainly not going to write a book about the 2010 Panthers and this awful season. But, if I did -- or you did -- what would we call it? I'm going to give away two more copies of the Panthers book to the folks who submit the best -- i.e., likely the funniest -- title for a proposed book about this 2010 Panthers season. Rules: Use the blog comments section directly below this post so everyone can enjoy your submission. DO NOT submit more than two proposed titles per person. DO NOT use any obscenities. Other than that, anything goes. You DON'T have to post your full name or address in the comments section -- once I announce the winners, you can contact me with that info. You have until the 4:15 p.m. Sunday, Dec.5th kickoff between Seattle and Carolina to submit these proposed titles, and I'll announce the winners in my traditional postgame "5 things" blog that will be posted no later than 8:30 p.m. Sunday night. Again, good luck if you choose to enter, and either way, thanks so much for reading "Scott Says" and The Charlotte Observer! People do not like to admit they are wrong, but my actions in Milwaukee last week resulted in an ejection and ultimately an NBA suspension for the next game. As a result, I let myself, my teammates and my coaches down, but more importantly, I let our fans down. In my heart, I know I have to adjust my emotions on the floor and I vow to work harder than ever to not put myself or this team in that situation again. I understand the rules that the NBA has established to govern players’ behavior on the floor and I respect the job the officials have each night. NBA players are bigger, faster and more athletic than ever, so being able to call a perfect game each night and see every foul is tough, and I have to take that into consideration. (Read the full letter here in Rick Bonnell's always excellent Bobcats blog). After being around Jackson a good bit, I believe he has the best of intentions. I think he truly wants to "adjust my emotions," as he puts it. He wants to win. He doesn't like to let people down. And this letter is a nice gesture -- many athletes have done a lot worse than this and never apologized for it. Cynically, I wonder how long it will take for Jackson to get his next technical and/or to berate the next ref who fails to call a foul when he drives to the basket (and he always thinks he gets fouled, on practically every drive). But I'm willing to give Jackson another chance. I've written many times that he needs to change his attitude and control his temper on the court. Say this for him -- he's obviously trying to do just that. -- It’s going to be weird Sunday not turning on the TV until 4:15 p.m. for a Carolina game. The Panthers are so thoroughly a “Sunday at 1 p.m.” team – the place TV networks love to stash bad teams that don’t draw a big national audience – that this will be their first non-1 p.m. game of the season and comes only because the game is on the West Coast. -- Five years ago, these two teams met in Seattle in the NFC championship game, with the Seahawks winning easily and advancing to a Super Bowl they would ultimately lose to Pittsburgh. The two teams haven’t played in Seattle since, but they sure have gotten worse. -- Seattle got creamed in rushing yardage last week, 270-20, in its 42-24 loss to Kansas City. The Panthers’ chance Sunday hinges on the team gaining more rushing yardage than its season high of 151, set last week in Cleveland. -- Seattle coach Pete Carroll once tried hard to recruit Jimmy Clausen to Southern Cal. Clausen, who grew up in California, chose Notre Dame instead but then never beat the Trojans in his college career. He’d love to get his first NFL win over Carroll Sunday, although the very loud crowd in Seattle won’t be easy on a rookie quarterback. -- The Panthers actually have a shot in this one, mostly based on their running game. But I’m 8-3 picking Panther outcomes this season, and that’s because I almost always pick them to lose. I’m not going to mess with that formula now. Prediction: Seattle 24, Carolina 16. -- Note to "Scott Says" readers: This post represents the 1,000th blog post I have filed since the "Scott Says" blog went live in 2008. In honor of that anniversary, I will have a random giveaway of "Tales from the Carolina Panthers Sideline" -- the book I wrote on the Panthers back when they were actually a very good team. You can only enter by e-mailing your name and address to ScottFowlerBooks@aol.com by 6 p.m. Eastern time on Friday, Dec.3rd (I'm using that e-mail address for this instead of my Observer one due to e-mail space considerations). Please put "Panthers book" in the subject line (although it does not disqualify you if you forget to do that -- it just helps me with my bookkeeping). Five readers will win a signed copy of the book, and those five will all be notified via e-mail by 1 p.m. Saturday, Dec.4th. Good luck -- and thanks so much for reading "Scott Says." Panthers safety Sherrod Martin has been fined $40,000 today for a helmet-to-helmet hit he doled out in Sunday's game against Cleveland at the goal line. I was in Cleveland, and Martin's hit was definitely illegal (although I don't think he did it on purpose). But the size of the fine is awfully large given that Tennessee's Cortland Finnegan and Houston's Andre Johnson were fined only $25,000 for engaging in a brief but full-scale fight Sunday which included ripping off each others' helmets and Johnson landing three punches to Finnegan's unprotected head. That's just wrong. If you are going to give Martin a 40K fine -- and I understand he's a repeat offender, as he got fined $5,000 for another illegal hit in Week 1 -- then Finnegan and Johnson should have been suspended for a game apiece and lose the game check that goes along with it. Martin is appealing the fine, as he should, although the way the NFL is cracking down on helmet-to-helmet hits I doubt that he'll get much mercy from the league. Finnegan and Johnson, though, should consider themselves extremely lucky, because what they did, to me, was worse. Or, as Martin's Carolina teammate Tyrell Sutton colloquially put it in his Twitter account today: "Crazy tht Sherrod got a 40k fine for a hit n the middle of the game but Andre johnson and cortland finnegan got 25k each for a fite. Bogus"